Aesthetically I’ve always considered the Honda CRX to be ahead of its time. By no means am I claiming to be a fan of the car’s Kammback design but its styling was edgy and unique for the time period in which it debuted. Perhaps the most impressive attribute of the CRX, however, is its fuel mileage, claimed to be anywhere from 35-50 mpg depending on powertrain. 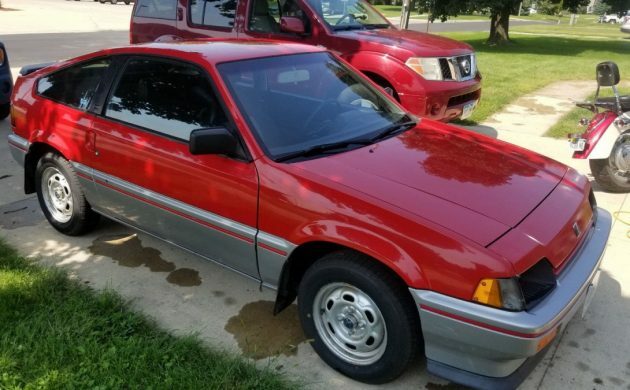 This ’84 CRX located in Clarion, Iowa and for sale here on ebay with a BIN of $6,000, features the desirable DX trim for the year that included the more powerful 1.5-liter inline four producing 76 hp. With a gross weight of approximately 1,700 lbs., this sporty two-seater is capable of ample acceleration and as most CRX owners will tell you, these agile little cars are fun to drive. Be prepared to be shamed by the seller if you’re interested in buying this 1st generation CRX however, as he brazenly states: “AC? No. Deal with it. Power steering? No. Deal with it. Do more curls. Power door locks? Are you not detecting a theme?” I’m always amazed and often entertained by the sales tactics of ebay and Craigslist sellers, but shaming potential buyers might be a new all-time low. On the contrary, I must credit the seller for providing ample photos of the car and a great description of the work he’s had done since owning it for the past year. He claims to have bought the car from the original owner who put a mere 66,000 miles on it in 23 years (the car now shows 67,660 on the clock). Maintenance performed includes a new timing belt and water pump, oil and transmission fluid change, new plugs and wires, tires, headlamps, necessary repairs to the suspension, and a cassette deck with Pioneer speakers throughout. Retro! 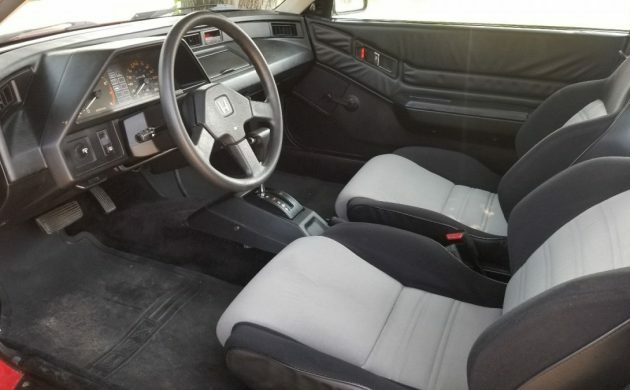 Photos of the car’s interior reveal it’s been well-cared-for and is in great original condition for its age. Honda has forever enjoyed a reputation for reliability but it’s been reported that prior to the advent of the Si engine in 1985, some 1st generation CRX’s with EW-series motors can be prone to head gasket failure. 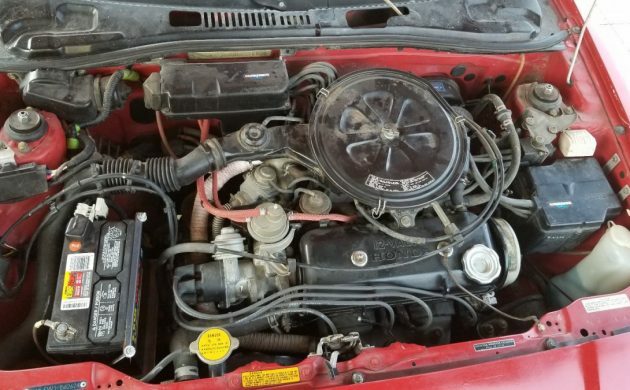 The seller reports no known issues with this motor and claims the car is “cherry.” That might be a stretch considering there are some cosmetic issues that need to be addressed such as cracks in the front bumper, scratches in the lower body trim, a dent in the rear, a rust bubble above the rear wheel well and an issue with the driver side door that hasn’t been addressed. 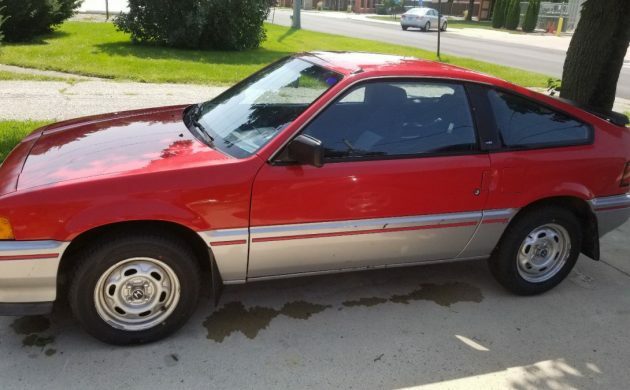 Although this certainly looks like a well-kept early CRX the seller’s price of $6,000 is probably a bit too ambitious. Considering potential owners are also pressured to begin a bicep curl workout regimen I’d be surprised if this car doesn’t show up again on ebay once the current listing expires but at a reduced price. Close examination finds some questionable paint issues as well. That is not factory orange peel I’m seeing. Exactly—Automatic, non SI model with no A/C? Deal with the undesirability. I’ve had several friends that have owned these cars. 4 of them were in very low speed accidents (less than 15 mph) – all wearing seat belts — and all 4 got hurt pretty bad — one VERY bad. The other friend sold his out of fear after seeing what happened to the others. Cute cars and the HF model is a gas sipper – but no way earth I will ever have one of these death traps. $900 – 2K $ fits.